in 1939 to watch "Aida"
Rome August 1939: World War II is about to break out but in taking his seat (stall C 20) at Caracalla, the unknown member of the audience whose Aida programme I bought at the flea market of Porta Portese in February 2004, was most likely more worried about the weather than about political developments. The long, hot and humid day was ending under a cloudy sky, but soon after sunset the western breeze (il ponentino) refreshed the air and cleared the sky. The great event was about to start. An opera is always about a tenor who loves a soprano, but cannot fulfil his desire because of an evil baritone. This applied also to the drama of Aida and Rhadames, torn between love and loyalty to their country. However the spectacular scenes set in the background of the gigantic pillars which once supported the vault of the baths had such an evocative impact on the viewer that the unlikeliness of the plot did not matter to the audience. The Fascist Government emphasized the monumental aspects of the surviving buildings of Ancient Rome. In doing so it deprived the city of Rome of an excellent concert hall (Augusteo) to bring back to light the bare walls of Mausoleo di Augusto, the tomb of the first Roman emperor. 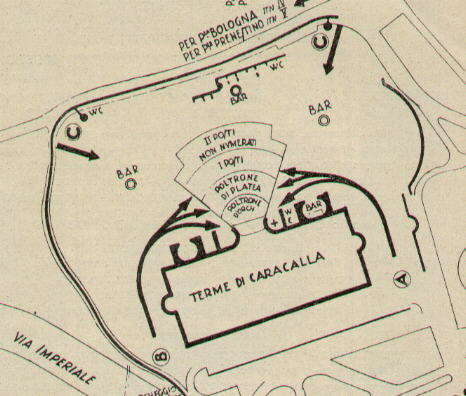 In 1937 it did in a certain way the opposite by turning Terme di Caracalla into an open air theatre. The etching by Giovan Battista Piranesi shows the two pillars with an arch between them, which does not exist any longer. The first Summer Opera Season met with great success, although the lack of a proper odeon-like layout impacted on the acoustics. The opera seasons which followed were aimed at making the most of the opportunities for scenes of an unseen dimension and Aida by Giuseppe Verdi with its triumphal procession became a "must" of the Caracalla season. The stage was located between the two surviving pillars of the Calidarium while the backstage, toilets and other facilities occupied the ancillary rooms of the ancient baths. Special transportation was arranged to allow the audience to reach Caracalla. Giuseppe Verdi became an acclaimed composer in 1842 with Nabucco a drama on the Jews under the Babylonian rule. The chorus Va pensiero sull'ali dorate was immediately seen as applicable to the Italians under the Austrian rule. After 1849 V.E.R.D.I. became an acronym meaning Vittorio Emanuele Re D'Italia (Victor Emmanuel King of Italy). With Rigoletto (1851), Trovatore (1853) and Traviata (1853) Verdi acquired an international reputation and he was commissioned operas by the main European theatres. Ismail Pacha, Khèdive of Egypt, in its effort to modernize the country and to celebrate the opening of the Suez Canal commissioned Verdi an opera set in Egypt. The première of Aida was delayed by the 1870 war: eventually it took place on December 24, 1871 at the Cairo Opera House. Oliviero de Fabritiis can be considered the father of the opera season at Caracalla as he held the role of Artistic Director of the Roman Opera Theatre. His career continued after World War II and he has left ample records of performances conducted by him. Nicola Benois was a renowned scene-painter. His father Alexandre had designed the scenes for the Russian ballets in Paris in 1909. Nicola came to Italy in 1926 where he worked and lived until his death in 1982. Attilia Radice was the first dancer of the ballet. She had started her career at Teatro alla Scala in Milan. After leaving the stage she taught dance at Teatro dell'Opera in Rome. Beniamino Gigli, tenor, was no doubt the star of the performance. Born in 1890 he was at the peak of his career and he was regarded as the successor of Caruso. In general pre-war audiences were less interested than today's audiences in the dramatic skills of the singers or in their appearance being consistent with their character in the plot. In this performance Gigli, aged 48 played Rhadames, a young warrior, while Gino Bechi, aged 25, played Amonasro, the father of Aida. Iva Pacetti, Aida, soprano, was a highly admired singer at both Teatro dell'Opera in Roma and Teatro alla Scala in Milan between 1927 and 1942. Ebe Stignani, Amneris, mezzo-soprano, continued her career after the war and her appearance in Norma with Maria Callas in 1951 at both Teatro alla Scala and the Covent Garden is memorable. As all mezzo-soprano she played evil characters. In particular she excelled as Azucena, the old gipsy of Trovatore. Gino Bechi, Amonasro, baritone, notwithstanding his young age was already an acclaimed singer. After World War II he became a celebrity and had a long and successful career. The most spectacular scenes are those of the second (triumphal procession of Rhadames) and fourth act (Temple of Vulcan and below it the dungeon where Rhadames is buried). The arrival of Rhadamès on a chariot drawn by black horses is the crucial moment of the opera from a spectacular viewpoint. The photo was taken in August 1939 and put in the pages of the programme. Rhadamès (tenor), Captain of the Guards, is in a salon of the King's Palace at Memphis, dreaming that he has been nominated by the Goddess Isis, head of the Egyptian Army against the Ethiopians, who are threatening the valley of the Nile and Thebes. His great ambition is to return from this enterprise covered with glory and to place his crown of victory at the feet of Aida (Se quel guerrier io fossi... Celeste Aida). Amneris (mezzo-soprano), daughter of the King of Egypt, suspects that she has a rival in this affectionate and devoted slave, because the Pharaoh's daughter is also in love with Rhadamès. But the heart of Aida (soprano) is troubled by a still more tragic and painful secret. Beneath the disguise of a slave her real personality is hidden: she is the daughter of Amonasro, King of the Ethiopians. When, by the will of the Gods, the King chooses Rhadamès as leader of the Army, Aida is torn by conflicting emotions: her love for Rhadamès, to whom, with the rest of the people, she raises the terrible cry of "Return a Conqueror!" (Ritorna vincitor!) and her love of her country against which her idol is about to march. Interior of the Temple of Vulcan at Memphis where the propitiatory rites are being performed while Rhadamès is being invested with the sacred arms. In one of the rooms of her apartment, the King's daughter is surrounded by her slaves, who are dressing her for the triumphal fete in honour of Rhadamès, returning conqueror. Aida comes in and remains alone with Amneris who, in order to discover the feelings of her slave and rival, pretends that Rhadamès has been killed in battle (Fu la sorte dell'armi). Aida's cry is a proof of her great love for the young warrior and Amneris confesses that the news is not true, at the same time proudly stating that she also loves Rhadamès. Aida falls on her knees and implores pity, but Amneris swears that she will have her revenge. The King and his suite enter through one of the gates of Thebes, followed by Amneris, with Aida and the other slaves. The people sing hymns of joy (Gloria all'Egitto), while bands of maidens whirl in a dance of victory. The Egyptians troops, heralded by fanfares, file before the King, followed by war chariots, standards, the sacred vases and statues of the Gods. The dancers bear the victor's trophies. Rhadamès arrives, welcomed and embraced by the King; Amneris offers him the triumphal crown. Then, by the desire of Rhadamès, the Ethiopian prisoners are brought in. Among them is Amonasro (baritone), disguised as a simple officer. Aida embraces her father, but he begs her not to betray him or to reveal who he is (Quest'assisa ch'io vesto). In fact, in order to deceive his conquerors, Amonasro pretends that the King of the Ethiopians is dead, so that the Egyptians will not fear a prompt reopening of hostilities on the part of the Ethiopians who are now deprived of their King and Leader. This deception effects its aim, for the King agrees to the conqueror's desire that the prisoners shall be granted life and liberty. The priests alone are against this act of clemency (Son nemici e prodi sono), but they succeed in persuading the King to keep, as a hostage, one man only, namely Amonasro, father of Aida. The Egyptian King then offers the hand of his daughter to Rhadamès as a compensation for the services he has rendered to his country. Amneris breaks out into exclamations of joy, while Rhadamès is saying sadly to himself that the throne of Egypt is not worth the heart of Aida. While the people are praising the victors, Amonasro is meditating vengeance. The moon is shining on the banks of the Nile. While Amneris, followed by the priests and maidens, is on her way to the Temple of Isis to ask for the help of the Goddess, Aida comes to the lonely spot where Rhadamès had asked her to meet him (O cieli azzurri). Suddenly Amonasro appears before her; he has discovered her love for Rhadamès and urges his daughter to get him to reveal his secret war plans to her (A te grave cagione m'adduce, Aida). At first she refuses, but when her father threatens to curse her she ends by doing as he wishes. As Rhadamès appears (Pur ti riveggo mia dolce Aida), Amonasro hides among the palms, where he can hear every word the lovers speak. His savage heart leaps with joy when he hears that Rhadamès not only agrees to fly to Ethiopia with Aida, but that the road chosen by the Egyptians to fall upon their enemy is that which runs through the pass of Napata (Ma, dimmi: per qual via). Amonasro's cry of joy is heard by Rhadamès, to whom the former reveals his real identity. Rhadamès is in agony at the thought that he has betrayed his country and Amonasro and Aida try to calm him in vain. Rhadamès is surprised by Amneris who denounces him to the High Priest. The guards arrest him, while Amonasro, after vainly attempting to stab Amneris, flees with Aida. In a room in the King's Palace, Amneris filled with remorse, is thinking how she can save her idol. Rhadamès is brought by the guards through the room on his way to the dungeons, where the priests are gathered together for his trial. Amneris begs him to exculpate himself, promising that she will obtain his pardon from the King. But he is determined to die, although he knows now that Aida was not killed as he thought but has fled in safety to her own country (L'aborrita rivale a me sfuggia). Shortly afterwards, in indescribable anguish, Amneris hears the sentence passed by the implacable priests (Ohimé!...morir mi sento..). Rhadamès is to be buried alive beneath the altar of the God he has betrayed. The unhappy woman curses the ministers of the God in vain: the tragic fate of Rhadamès is decided. The scene is divided into two parts: the upper part representing the interior of the Temple of Vulcan, brilliantly lit up and glittering with gold, and the lower, a dungeon where Rhadamès is being closed in for ever, as the curtain rises. His last thoughts are thoughts of love for Aida, whom he believes to be far off and ignorant of his unhappy fate. But Aida is near to him in the horrible tomb where she had previously hidden herself; she had come there to die with him, while the sacred hymns and dances are being performed in the Temple above them. After vainly trying to force the door of the tomb, Rhadamès turns and takes Aida in his arms (La fatal pietra sovra me si chiuse). In the Temple above, Amneris, in mourning garments, lies prone on the stone over the tomb and implores peace for the spirit of her beloved. 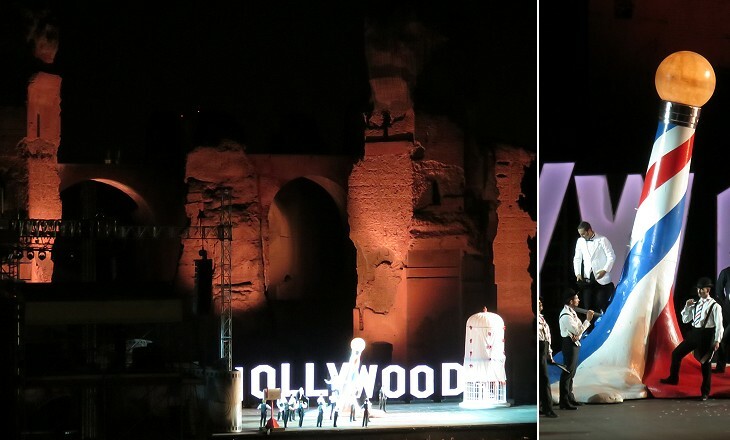 P. S.: After a stop which lasted several years, the Summer Opera Season is back at Caracalla, but the stage is located at some distance from the ruins.